Ace is the right partner for your business. We have perfected the refurbish process bringing you a superior product that is the best value for your money. Our multi function printers provide a more economical solution than individual printers. We provide affordable options for churches, ministries, non-profits and small businesses. From the smallest to the largest office Ace has a product to fit your needs. Color, print, copy, scan, fax, staple, fold and 3 hole punch. We offer the best purchasing plan for your company-cash, rent or lease. If you choose a no interest lease with Ace your lease is carried by Ace ensuring if your company experiences unusual growth and your needs change you are able to upgrade with us before your lease term is up without penalty. Our friendly, experienced staff works with you throughout the installation and training process to ensure your complete satisfaction. 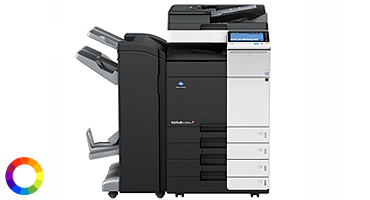 Whatever method your company uses to connect to the multi function printer our company has the staff with the knowledge to make it happen. Second to none in the industry our technician's arrive at your office in fully stocked vans able to take care of all your parts and supply needs on the first trip. This ensures less down time for your company. We provide same day service whenever possible. Connection/ printing problems? Call Ace first and we will diagnose your problem and in most instances solve the problem without I.T. support. Telephone support is available for those customers whose problem does not require an on-site visit. We specialize in working with churches and small companies who may not have full time office staff. We are available by telephone Monday through Friday from 7:00 a.m. to 4:30 p.m. You can also reach us by answering machine, fax machine 770-449-1407 or email at acesupplycompany@yahoo.com 24 hours a day, seven days a week. Check out our tip of the month on Facebook. If you have one of the products that we service and are not under a service agreement give us a call and find out why our customers love us. Our prices are competitive for service and supplies. 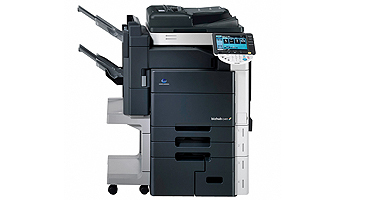 Count on the Konica Minolta bizhub C364e color laser multifunction printer for high-volume color and Black and White document traffic. Stay ahead of your business needs with built-in print control INFO-Palette design featuring a 9 touch screen color panel with downloadable productivity apps and optional single-pass dual scanning handling up to 160 originals per minute. Full color Printer/Copier/Scanner/Fax with stationary platen. All the power. All the speed. All the scanning flexibility and security protection, the print control and step-up options you need - in an all-in-one solution for both color and B&W. With 50 page per minute color output, high quality, high-impact color never slows you down. Full color Printer/Copier/Scanner/Fax with stationary platen. All the power. All the speed. All the scanning flexibility and security protection, the print control and step-up options you need - in an all-in-one solution for both color and B&W. With 45 page per minute color output, high quality, high-impact color never slows you down. 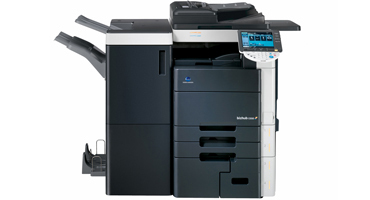 The Konica Minolta bizhub 364e offers up to 36 ppm print/copy speeds up to 160 opm and Black and White scanning and a large touchscreen display.